Everyone wants their relationship to go well with a home improvement contractor in Phoenix. Despite the horror stories you often hear about contractors wreaking all kinds of havoc on homeowner projects, many quality firms exist. The good remodeling companies have worked hard to build great track records and reputations. Selecting the most qualified contractor from the start will go a long way to ensuring your project will be delivered to your expectations. However, you can do a few things to help your relationship go smoothly. Your goal is to develop a comfortable relationship with your home improvement contractor in Phoenix. 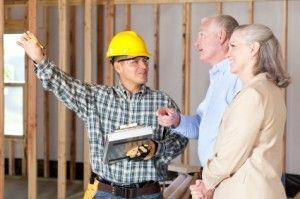 The following guidelines will help you establish the best possible relationship between you and your contractor. First, you want to work on the relationship before your job begins. If you don’t form the right relationship from the get-go, you are destined to have issues and disappointment during and after your project. If you do your homework properly in the beginning, chances are you’ll hire the right home improvement contractor in Phoenix. Keep in mind your relationship goal is one of mutual respect. A major mistake homeowners make is selecting a remodeling company based solely on price. All too often, you can end up paying more if you select the first company that offers you a rock-bottom price. Remodeling work costs a certain amount because of the going rate for time and materials. A bid that’s too high might mean there’s some “padding” in the project. A bid that’s too low could mean the contractor is going to cut corners to make the necessary profit. Either situation is not good and you must really understand the quotes you’re getting to compare apples-to-apples. To develop the best relationship and ensure the right outcome, you absolutely must evaluate several contractors. You also must check references for each home improvement contractor in Phoenix. Every home improvement project by its very nature will be disruptive. You’ll often have noise, mess and strangers coming in and out of your home. These things present a trying situation. You certainly don’t want to add a strained relationship to this situation. An experienced home improvement contractor in Phoenix will take all necessary measures to minimize disruptions. But, it’s equally important for you to try and stay out of the way of your workers and understand they’re just trying to do their jobs. Considerate, calm communication and actions will go a long way to building a strong relationship between homeowner and contractor. In part two of this series, we will discuss what to do if your relationship with your contractor falls short of your expectations. For more info on choosing a home improvement contractor, continue reading our blog or contact us with any questions.